community empowerment in responsible sourcing in the Eastern DRC gold sector. This platform will contribute to improving transparency around follow-up and resolution of incidents in cooperation with relevant stakeholders. IPIS has engaged in capacity enhancement of of 7 mining cooperatives through a series of trainings and follow-up visits led by CEGEMI (Centre d’Expertise en Gestion du secteur Minier). Details on this first phase of the project are available in the first progress report, issued in July 2018. Since the training, IPIS worked on the development of an incident reporting methodology, the Gold Incident Tracker developed by IPIS and powered by Ulula. 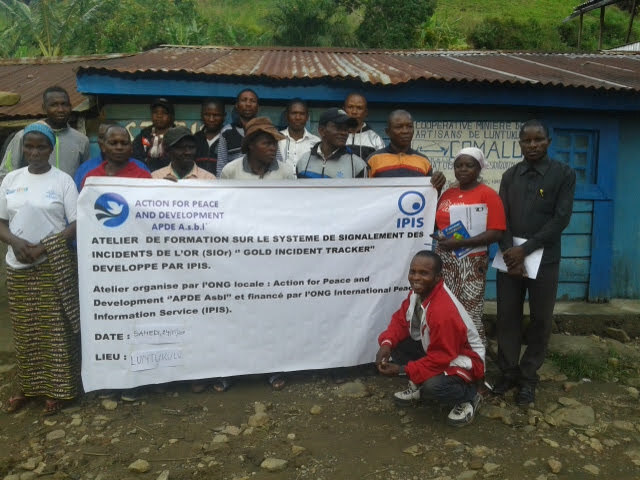 The Gold Incident Tracker is a tool for congolese civil society organisations to report and monitor incidents in Eastern DRC related to Annex II of the OECD Guidance on Responsible Minerals Sourcing in a transparent, independent and participatory way. This project is funded by the European Partnership for Responsible Minerals (EPRM). EPRM is a multi-stakeholder partnership established with the goal to create better social and economic conditions for mine workers and local mining communities, by increasing the number of mines that adopt responsible mining practices in Conflict and High Risk Areas (CAHRAs).